The desktop is the killer app for quad-core smartphones in 2012. 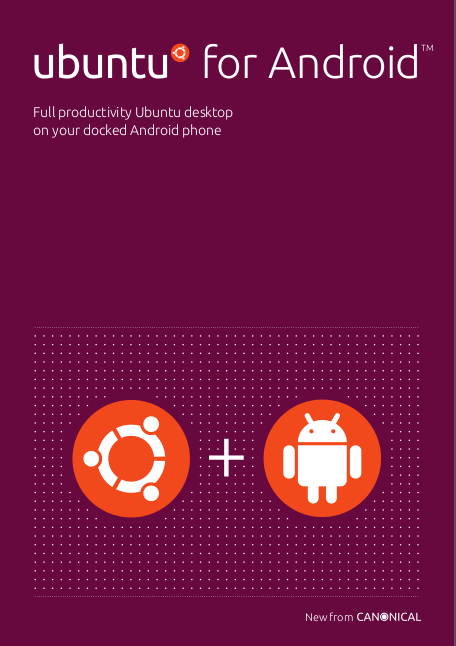 We’ll show Ubuntu neatly integrated into Android at Mobile World Congress next week. Carry just the phone, and connect it to any monitor to get a full Ubuntu desktop with all the native apps you want, running on the same device at the same time as Android. Magic. Everything important is shared across the desktop and the phone in real time. It’s a lightweight way to be – everything seamlessly available with the right interface for the right form factor, with no hassles syncing. It just works, the way Ubuntu should. Lots of work behind the scenes to make both systems share what they need to share, but the desktop is a no-compromise desktop. This isn’t the “Ubuntu Phone”. The phone experience here is pure Android. This announcement is playing to a different story, which is the convergence of multiple different form factors into one most-personal device. Naturally, the most personal device is the phone, so we want to get all of these different personalities – phone, tablet and desktop – into the phone. When you need a desktop, you connect up to a screen and a keyboard. When you need a tablet, you dock to some very elegant glass. Just for fun, we’ve integrated the Ubuntu TV experience too – so this isn’t just a desktop in your pocket, it’s a media centre too. Come and say hello in Barcelona next week, and I’ll be glad to hear what you think of it in person. Everyone we’ve shown it to has had a “wow!” moment. For network operators who have long believed that the phone was the PC of the future for the next billion connected consumers, and for handset manufacturers who want to offer companies a single device for corporate computing, this is a delicious prospect. For those of us who love our desktops free, focused and mobile, it’s nirvana. This entry was posted on Tuesday, February 21st, 2012 at 5:19 pm and is filed under ubuntu. You can follow any responses to this entry through the RSS 2.0 feed. Both comments and pings are currently closed. Not great. People were doing this on Maemo (Nokia n900) years ago so why does everyone think this is so freaking amazing? And this won’t be good open-source either. Try getting anything from ubuntu running on anything else but ubuntu and you’ll see what I mean. Open-source closed acting crap. I’m a bit confused here.. So by using this phone while plugged into a screen and keyboard, then whats the use of a systembox? The phone will be basically a sytem box itself right? I want it! When is it to be released? What about phone battery? Arent android phones useless with the current state of phone battery capacity? I was traumatized by a motorola milestone before switching to an iphone. Just one thing, don’t let the wireless carriers or manufacturers pollute the Ubuntu experience, like they did with Android. They don’t understand software or user experience. Mark, this is fantastic. I with @Sebastian above: would it be feasible to have an android environment integrated in the Desktop Ubuntu? It could be a widget that contains Android “apps”. I wish this was available 5 years ago for my Dell X51v PDA. At the time, that device was cutting edge. I used it at work, connecting it to an external 1280×1024 display, using a BT mouse and keyboard with a WIFI network connection – a true desktop in your pocket. It’s too bad this was not available for the Xscale processor back then. This will bring endless possibilities, limited just by imagination. Later they can remove the docks with Bluetooth or some other wireless connectivity……. they can ‘Ubuntize’ vehicles so that when you step in, your dash will have whole lot of information’s/navigation/entertainment …… they can ‘Ubuntize’ your home…. ‘Ubuntize’ your office …. Good job Mark and Co. Impressive. What kind of Android devices are on the market right that have such a dock? @Mark: Too many projects!! You need some focus there, Canonical is no Apple or Microsoft or even Google in terms of size, don’t spread yourself too thin. My main worry though is unity (I replaced it by gnome-shell and I am far from being the only person using it), I know it is a recent project but it should have started to get better by now :S.
That being said I love that dual android/ubuntu idea.